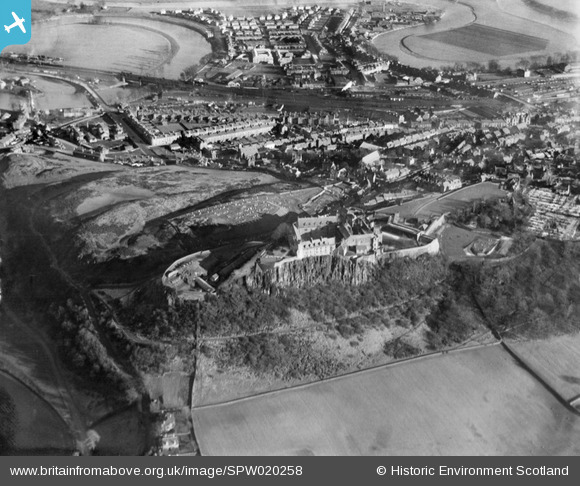 SPW020258 SCOTLAND (1928). 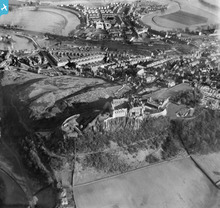 Stirling, general view, showing Stirling Castle and Gowan Hill. An oblique aerial photograph taken facing east. Title [SPW020258] Stirling, general view, showing Stirling Castle and Gowan Hill. An oblique aerial photograph taken facing east. These rail sidings are now home to a modern road and a Tesco supermarket. Old Stirling Bridge, the site where Wallace used strategic advantage to overcome a much bigger force. There has been a castle here since at least the 1100s and probably much earlier. The first written record is from 1110, when king Alexander I dedicated a chapel at the castle. Further up the road was the cattle market. River Forth is in flood if you look closely.